Photography is a powerful tool for conveying a story in just an image. In that sense, it’s easy to see how important marijuana photography jobs are for transforming cannabis from stigmatized Schedule 1 drug to the medically beneficial, responsibly used substance it can be. Artists and creative types have long been associated with the movement for comprehensive cannabis legalization. With roots in counterculture, marijuana has fascinated and inspired photographers, writers, painters and more to give this plant the attention it deserves. It’s up to these creatives with an eye for detail and a desire to illuminate that has cannabis dispensaries, magazines, clothing lines and more contracting out photographers to let the plant shine. The process of securing consistent marijuana photography jobs won’t occur overnight, but determined individuals will find that working professional marijuana photography jobs is possible, and can financially support photographers through full time work. In terms of how to go about getting paid to snap pics, consider these following options. Working photographers come from vastly diverse backgrounds, including their credentials. Unlike some fields where every job requires formal university education, photography careers are made up by college educated and self taught artists. With that said, traditional college programs are a great way to gain experience for those who like a structured classroom setting (in person and online). Attending an accredited photography program or conservatory is a sure fire way to become exposed to a wide variety of styles, photographers, and their work. The other benefit of formal education is the opportunity it presents to make business connections. By interacting with experienced professors and talented peers, these relationships could become the basis upon which your marijuana photography career is built. For those unable to take advantage of a university education due to financial hardship, accessibility, or because they just don’t like traditionally academic atmospheres, there are plenty of opportunities to work your way into marijuana photography jobs. You’ve probably heard that experience is the best education. In part, this rings true for photographers. If you are a job candidate with a strong portfolio and professional experience, your lack of a degree won’t deter employers like it may in other fields. As I just mentioned, having a strong portfolio is THE asset to have. Regardless of who you are, how you found out about the job, or where you studied, employers are dialing in on applicant portfolios before concerning themselves with the rest. Presenting a well conceived, developed and organized portfolio can tell a potential employer so many things about a photographer’s artistic eye, how the picture was shot and so much more. In a perfect world, a photographer’s portfolio would naturally take shape after working a number of different jobs. Realistically, photographers have to dedicate personal time to building their portfolio. Especially when it comes to cannabis, there haven’t been the same demand for cannabis photographers until the legal market broke and cannabis culture bloomed once more. The best thing marijuana photography job seekers can do is spend some quality time with cannabis and experiment with taking pictures of the plant, its flowers, and the many forms it takes upon extraction. Getting hired to work a one time gig may be fun and all, but most photographers would prefer regular clients who consistently request their services. Building up a network of clients engenders exponential results. Once a big enough web has formed, photographers start finding more marijuana photography jobs thanks to word of mouth from clients to their friends and family. Client building isn’t an exact science and it can’t be forced. When establishing freelance marijuana jobs, contractors will benefit from investing time and energy into building a network of clients that support them. In the past few years, the word “brand” has been omnipresent in mainstream culture as a term used to solidify the personal and professional characteristics that makes one person stand out from the billions of others out there. For marijuana photography jobs, establishing a brand and subsequently marketing it, can be your best bet for making connections across the cannabis and photography industries. What Services Require Marijuana Photography? If you’re wondering whether or not the cannabis industry has the potential to offer enough consistent marijuana photography jobs to sustain a real career, consider the exponential growth of the cannabis industry. Not only are marijuana photographers producing images of cannabis plants and flowers, they also play an important role in establishing advertising material for other cannabusinesses, such as dispensaries, grow operations and extraction labs. A specialized marijuana photography is able to diversify their subject within the marijuana industry, including shooting the images themselves, as well as anything else to do with the culture of legal cannabis. How is Marijuana Photography Different? Every photography subject requires individual attention and different shooting and processing techniques. Marijuana photography jobs place a large emphasis on lighting and color balancing and benefit from skilled photo editors. Technically, anyone with a camera, cannabis, and the ability to print an upload images can photograph marijuana. However, marijuana photography jobs hire professional individuals, who know that the power of cannabis is in the detail. When examining mature cannabis flowers, it’s almost unbelievable how much power is contained within such a small surface area to the human eye. Cannabis flowers contain the highest concentrations of the necessary compounds in mature cannabis plants that facilitate effects, medical uses and tastes/aromas. THC, CBD and terpenes are all held in the jars upon jars of buds found behind dispensary counters–but what makes them all individual? This is where the marijuana photographers come in. Though they may not be able to verbalize the extent to which the cannabinoids and terpenoids of individual flowers create the effects of each strain, photography can help to illuminate the minute details of each flower, giving a strong visual representation in addition to the factual information that comes with scientific and experiential research. Since the cannabusiness is a rapidly developing one, working marijuana photography jobs is not for those who are looking for a run of the mill experience. Photographers must be perceptive, but also able to think on their feet and make decisions in a quick and confident manner. Not only are cannabis photographers aiding the cannabis industry’s growth, they are also leading it. In an interview on Vice.com with noted cannabis photographer Marcus Gary “Bubbleman,” the photographer spoke of how his macro shots of three types of solventless hash known as rosin, bubblehash and dry sift brought imagery of the cannabis plant that no one else in the world had seen. It’s easier to see now how marijuana photography jobs are much more than point and shoot pursuits. These jobs are for passionate individuals how want to exposure and explore a wider circulation of cannabis imagery. Photography as an industry is experiencing a similar ebb and flow as other publishing industry jobs, as a result of online media take over and an oversaturated job seeker pool. 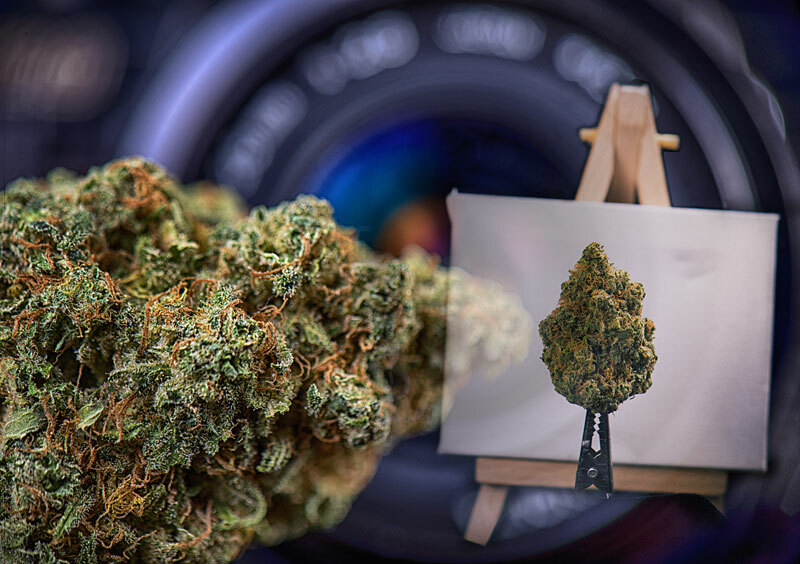 Ron Goldman, a professional cannabis photographer laments how the digital era has facilitated novice camera-owners to deem themselves professionals and sell their work at an extremely low price, or give it away for free. Even if the work was not up to the quality of professional photographers, some businesses chose to take lower quality free imagery, rather than paying. This “devaluation” of the photographer as Goldman deems it, has made it essential for artists and creative professionals can band together, so that work of this kind is compensated fairly. Despite this unfortunate trend, there is much to be hopeful for with marijuana photography jobs as the industry continues to unfold. Especially for those following cannabis legislation and actively involving themselves in marijuana culture, the coming years will offer greater opportunities for photographers to capitalize on the boom of the business and demonstrate how important it is that images of the cannabusiness are so much more than just an image. Photographers hold a powerful position in this industry, and contribute to how it is viewed in the media and therefore, voted on. Though the exact path of this industry still remains unclear, marijuana photography job seekers are putting themselves out there to see if the grass is really greener.